The present tense is a form of grammatical tense. It is mainly used to indicate something that is in the present or something that is happening now. There are two common types of present tense: the present indicative, which is the combination of present tense and indicative mood, and the present subjunctive, which is the combination of present tense and subjunctive mood. I work at McDonald’s. This indicates that I am currently working at McDonald’s. This is my job. In English, the present tense can be used to talk about the present, the past and the future. Let us use examples to understand. To talk about the present: The bus to New York is here. To talk about the future: The next bus to New York is at 5 o’clock. To talk about the past: Last night, I was sitting here, when I suddenly see the bus to New York. There are four different types of present tense in the English language. They are the simple present tense, present progressive tense, present perfect tense, and present perfect progressive. The examples above mainly belong to the present simple. 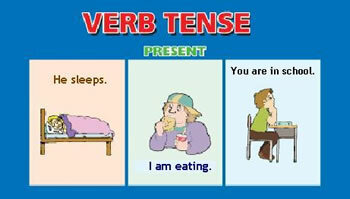 Let us understand the different types of present tense, via an example. Simple present tense: Used to describe facts and habits, scheduled events and to tell stories. I like cake. So, I walk into a bakery and taste all the cakes they have. Present progressive tense: Used for an on-going action in the present. Joan is looking to finish her work today. Present perfect tense: used to describe actions that began in the past and are still continuing into the present. Mary has been working at the same job for 10 years. Present perfect progressive: Used for a continuous activity that began in the past and continues into the present, or that began in past but has now recently finished. John has been working very hard to get a promotion.